If you are you looking for an all action racket sport that you can play all year round, then check out Squash and Racketball! 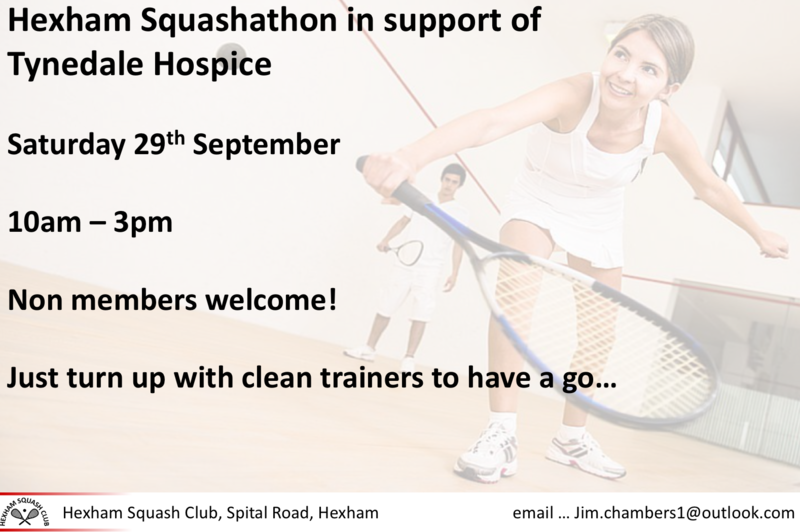 September marks the start of the squash season and Hexham Squash club are hosting an open-day event and Squashathon in aid of Tynedale Hospice on Saturday 29th September from10am-3pm. Whether you are an ex-player, beginner, or just want to check it out you are welcome to come along to the club on Saturday. The club is based at Hexham Golf Club, Spital Lane, and caters for a range of standards and ages with social players, internal leagues as well as 3 men’s and 1 ladies’ teams in the Northumbria Squash leagues. We hold regular junior coaching sessions and have 3 England Squash level 2 coaches as well as level 1 coaches. We have three County Junior representatives at U15 level and are keen to attract more juniors. 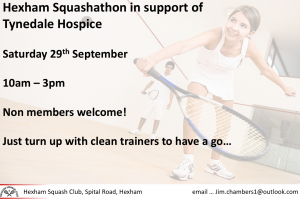 Whether you are looking to spark a lost interest in racket sports or just try something new, come along this Saturday to Hexham Golf Club…the squash facilities are just behind the golf club house. For more information speak to Damon Watts (Chair) 07740836324 or Jim Chambers (lead coach) 07754186699.